Over three plus decades I’ve completed many home improvement remodeling projects. I’ve done everything from finishing basements, to remodeling kitchens and bathrooms, to building home additions and homes. If I could give just three pieces of advice to homeowners planning to tackle their own large home improvement remodeling project it would be (1) plan well (2) pay close attention to detail, and (3) hire the right general contractor. These three tips can save a homeowner thousands of dollars and prevent much heartache and frustration. They can also assure that the home remodeling or construction project gets done correctly, and on time and budget. If you have your own large home improvement remodeling project plans start with pencil and paper and jot down what you’re trying to achieve with your project. For example, what type of space are you trying to create with your remodeling project? Are you looking to create more living space or simply remodel an existing space? Second, determine your home remodeling budget as early in the planning process as possible. This way you can make sure your home improvement remodeling dreams are consistent with your budget and financing capabilities. It’s a common problem for many a homeowner to develop a home remodeling plan that is out of step with their financial means. Also, make sure to include in your home improvement remodeling budget a 10% buffer for contingencies such as cost overruns and bad weather that can delay the project. Once you’ve outlined your home improvement remodeling plans and budget you can then begin to flesh out the details of your project. I highly advise working with an architect or kitchen/bathroom designer. 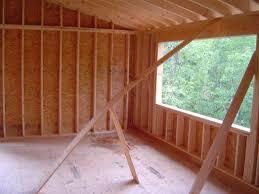 They can ensure that your home remodeling project will be constructed properly and to building codes. They can also help to make sure you pay attention to all of the details. These advantages help tremendously in the permit and construction process, as well as ensure you get the finished home improvement remodeling project you’re looking for. After getting a complete set of home remodeling plans you can then solicit contractor bids. If I could offer only one key piece of advice when it comes to finding a home remodeling contractor it would be to check references. If a contractor refuses to give you references or suspect references move on. Ideally the prospective home remodeling contractor should provide you with a list of references that span a time frame from recent projects to ones that are a few years old. This way you can get a feel for the contractor’s current work ethic and how well his work holds up to the test of time. As part of any home improvement remodeling contractor bid it should include a complete breakout of costs, both labor and materials. In addition, it should include a detailed schedule. The more detail in the costs and schedule the more likelihood that the contractor has a solid handle on the cost and scope of the project. Once you’ve selected a contractor you can now begin the actual home remodeling. Make sure during the construction that you talk regularly with the contractor, daily if possible. Confirm by your own site inspections and talking with the general contractor that the project is being constructed to the exact home remodeling plans. If you see any discrepancies let the contractor know as soon as possible. The longer you delay in communicating your issues the higher the cost of fixing the problem and the increased likelihood of uncomfortable situations. Also, make sure any building code inspections occur when they are supposed to, and hold off making any incremental payments to the contractor until both you and the local building inspector are satisfied with the work. By following these few simple bits of advice you can dramatically improve the chances of having a successful home improvement remodeling project. Want to Build your Own House? 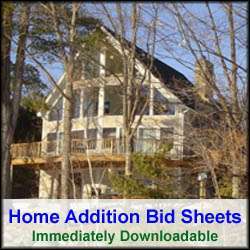 See HomeAdditionPlus.com’s Home Addition Bid Sheets. Our Home Addition Bid Sheets provide you with the knowledge and information on how to plan a home building project, and what to look for when hiring contractors. They also include detailed cost breakdown tables and spreadsheets for estimating your own new home construction building costs.